When it comes to Bruce Lee imitators, Bruce Li set the standard. He was among the very first out the gate after the Death of Bruce Lee, and with good reason. He pretty much nailed all of Lee’s mannerisms and put them on display just enough as not to overdo it. While most Lee imitator’s mimicry bordered on tactless parody, Bruce Li was actually very believable, masterful even, in his portrayals of Lee. 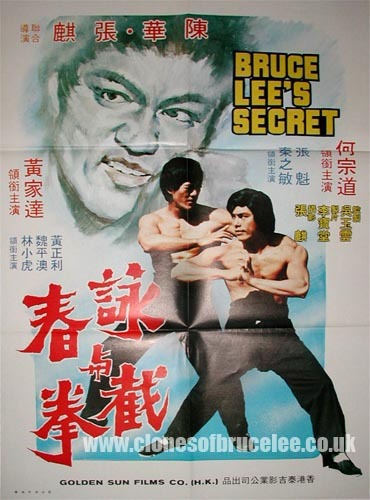 Li, whose real name was Ho Chung-Tao, was busy working as a stuntman in his native Taiwan, trying to break into the film industry with no success. It was only after the death of Bruce Lee, that producers in Hong Kong took notice of his resemblance and virtually launched him to superstardom overnight. Ironically, Li’s claim to fame would haunt him for most of his career. In later interviews he expressed some pretty heavy resentment towards a film industry that pigeonholed him into living in the shadow of Lee, never really allowing him to distance himself from the role. (Which is a very valid argument, Bruce Li was a pretty accomplished martial artist in his own right.) He ended up retiring from acting altogether after the death of his wife in the early ’80s.